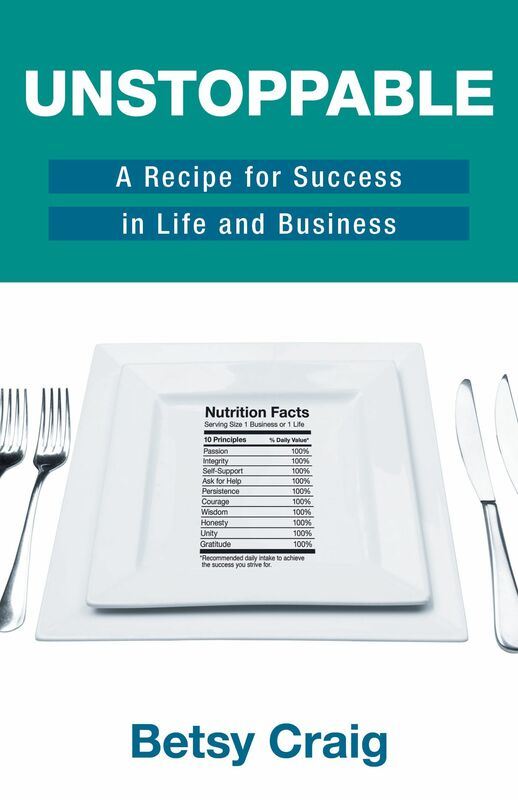 Fort Collins, CO (Restaurant News Release) CEO and Founder of MenuTrinfo®, AllerTrain™ and Kitchens with Confidence, Betsy Craig, released her first book this past Tuesday, June 5, 2018. Unstoppable, is a book outlining the 10 principles for success in business and Life. Craig developed these tools beginning at the age of 20, then beat the odds against autoimmune disease, scleroderma that wanted her dead in 2005 and on the heels of the economic downturn in 2010, she launched MenuTrinfo®, a menu labeling, food safety training, auditing and nutritional help desk service that is now a successful million-dollar business. Through her determination and spirit, Betsy became a leader in the foodservice industry protecting lives and health through nutrition and food safety training showing all along the way what it means to be unstoppable. She has founded three successful divisions of MenuTrinfo (Train, Audit, Verify) in the past eight years and is considered an expert in the menu labeling, food safety, food allergy and kitchen auditing worlds. Betsy is a professional public speaker and has been giving seminars on foodservice hot topics and overcoming scleroderma for the better part of a decade. Over the past 30 years, Betsy has lived by a set of 10 guiding principles that are the key ingredients in her recipe for success. They have helped her navigate through challenges and celebrate triumphs. In her book, Craig empowers the reader to not only cope but to create abundance out of trying circumstances. Her book chronicles a life of constantly overcoming new battles and coming out victorious with each one. Through alcoholism she found sobriety and a tribe that willed her to live, through scleroderma she faced death and found strength she never knew she had and through business she has had a platform to build a successful company in a niche that was otherwise vacant. Scleroderma, translated from Greek as “hard skin,” causes tightening of the skin and connective tissues that provide the framework for your body. In many, such as for Craig, it also damages internal organs and the digestive tract. Considered rare, an estimated 300,000 Americans have the disease. Currently, there is no cure. During a debilitating round of chemo, Craig pledged that if she survived she’d do something worthwhile in her life. Having reduced her scleroderma symptoms by avoiding foods that tend to cause inflammation, she formed a vision to challenge prevailing paradigms in the food industry. Craig committed to helping those that needed nutritional information in order to eat out as well as the 15 million people in the U.S. with food allergies, some life-threatening. In Unstoppable, Craig opens her business and life playbook. Today, her woman-owned company has grown into a million-dollar business that helps hundreds of thousands of food eating consumers daily. Those looking for nutritional information from her partner/clients restaurants, diners who want to eat safely with a food allergy or a special dietary need or students on hundreds of campuses throughout the US and Canada. Craig’s mission and resulting business lines touch on so many as a result of the services and new standards she developed. A portion of the proceeds from the sales of Unstoppable will be donated to the Rocky Mountain Chapter of the Scleroderma Foundation. Unstoppable is now available as an e-book and paperback on platforms such as Amazon, iBooks, Kindle, Nook, and Ingram. Links and additional information can be found at betsycraig.com. Those in the Rocky Mountain area are invited to join Betsy Craig at her book release celebration on Thursday, June 14th at Old Firehouse Books.